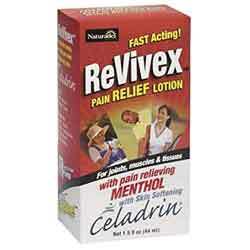 Revivex is a joint pain medication that uses Celadrin in its formula. In fact, most of the information available for Revivex can only be found on the official Celadrin website which is actually very detailed and user-friendly. According to the manufacturers of Celadrin, the substance, which is comprised of esterfying oils, is superior to the more common joint treatments, Glucosamine and Chondroitin. The site for Celadrin explains exactly how the substance works in the body and details several clinical studies that have proved its success in the long-term treatment of damaged joints. There are numerous customer testimonials provided which show how the product can be used not only on human joints, but also for animals suffering from similar problems. A lengthy FAQ section is also featured on the site, plus there are links to retailers selling the Revivex product, which is widely available in a non-prescription formula. Revivex joint medication is available as a topical cream and oral capsules. Studies have shown that either formula is quickly absorbed into the body and the user can experience relief within thirty minutes. However, like many over-the-counter products, Revivex has a cumulative effect, meaning that it takes approximately one month to reach its full potential. The only active ingredient in Revivex is Celadrin, which, as mentioned, is a scientifically arranged esterfying oil, comprised of bovine tallow oil. The major function of Celadrin is to lubricate the entire joint, including the tissue and muscles surrounding it. The substance works at a cellular level to reduce inflammation allowing for the damaged joint to heal itself naturally without the use of Glucosamine or Chondroitin. However, these substances can be used in conjunction with Celadrin which actually boosts the benefits of both. Celadrin, which is more powerful than EPA and DHA oils can be used with Omega-3 fatty acids for added lubrication. Revivex is available in different strengths and should be taken at a dose of 2 capsules once a day. To ‘kick-start’ treatment, the user can ‘load’ the medication, i.e. take double the dose for up to seven days. Rather confusingly, Celadrin appears to be featured in a number of other joint pain medications although Revivex seems to be the main brand. While there is no doubt that Celadrin is able to lubricate and improve flexibility in stiff joints, without Glucosamine or Chondroitin it is not clear exactly how well it would rebuild cartilage, apart from relying on the body’s own healing ability. However, because the reduction of inflammation is a major part of pain relief, Revivex would be an addition to any joint pain treatment routine.